One myth that Americans live by is the separation of church and state. Some like the idea, while others hate it but the irony is that church and state were not separated at the founding of the United States and are not separate now. In fact, they were united in the sense that the state is a church — the Church of America — and you can’t separate a thing from itself. The religion this church administers is not Catholicism, Protestantism, Judaism, Islam, or anything else that comes to mind when most people think the word religion. It’s Americanism, a species of nationalism. Nationalism and religion are cut from the same cloth. If it is true … that nationalism exhibits many of the characteristics of religion [and let’s see someone dispute that –SR] — including, most important for our purposes, the ability to organize killing energies — then what we have is not a separation of religion from politics but rather the substitution of the religion of the state for the religion of the church. As I commented before: “Perhaps we should read the First Amendment’s Establishment Clause — ‘Congress shall make no law respecting an establishment of religion’ — not as a mandated separation of religion and state but as a non-compete clause.” We could rewrite it to say: Congress shall make no law respecting an establishment of any other religion. To put it another way, other religions may exist, but they may not become rivals of the official religion, Americanism (nationalism). We see this, as Cavanaugh relates, in a 1940 Supreme Court case, Minersville School District v. Gobitis, in which Jehovah’s Witnesses were, in Cavanaugh’s words, “denied the right to dissent from patriotic rituals” by having their children abstain from pledging allegiance to the flag in school. In his 8-1 majority opinion, Justice Felix Frankfurter seemed to pay homage to freedom of religion as a means to avoid “bitter religious struggles.” But he did not extend this freedom to the Jehovah’s Witnesses. Today you cannot be compelled to pledge allegiance to the flag in school, but if you fail to stand for the national anthem or kneel during it at a football game, the president of the United States might demand your firing and many people will enthusiastically second the motion. In later Court cases, justices who declared prayer in government schools unconstitutional nevertheless found no problem with some government-sponsored religious invocations. For example, as Cavanaugh reports, Justice Potter Stewart, dissenting in Engel v. Vitale (1962), which declared official prayers in government schools unconstitutional, pointed out that the government has long permitted religious invocations at official proceedings. The Supreme Court itself begins sessions with “God save this honorable Court.” So, Stewart wondered, why not prayer in school? There is of course nothing in the decision reached here that is inconsistent with the fact that school children and others are officially encouraged to express love for our country by reciting historical documents such as the Declaration of Independence which contain references to the Deity or by singing officially espoused anthems which include the composer’s professions of faith in a Supreme Being, or with the fact that there are many manifestations in our public life of belief in God. Such patriotic or ceremonial occasions bear no true resemblance to the unquestioned religious exercise that the State has sponsored in this instance. In other words, theistic religion in the service of and subordinate to the secular religion, i.e., nationalism, is okay. But theistic religion had better know its place or else. It’s also more than a rally for the particular politician holding the office. It is that, of course, with each White House occupant cherry-picking good news about, say, the economy — whether he deserves credit or not — and delivering a long list of objectives for the next year(s), most of which will be promptly forgotten. This is all true, but it doesn’t fully capture the religious aspect. The State of the Union affair goes along with the many other secular rituals — the pledge of allegiance; the rules for handling the flag, the national anthem at sporting events with its required decorum; the reverence for military might, the national holy days, er, holidays — not to mention the dogma and catechism (America is the exceptional, indispensable nation; America is a force for good in the world; America is the world’s last best hope; America and its president are the leaders of the free world), all calculated to awe the citizenry, lest the people remind themselves that those who rule them — for deep down they know they do not rule themselves — are a bunch of mediocrities, posers, and usurpers — misleaders, misrepresentatives, and public self-servants, as I call them. 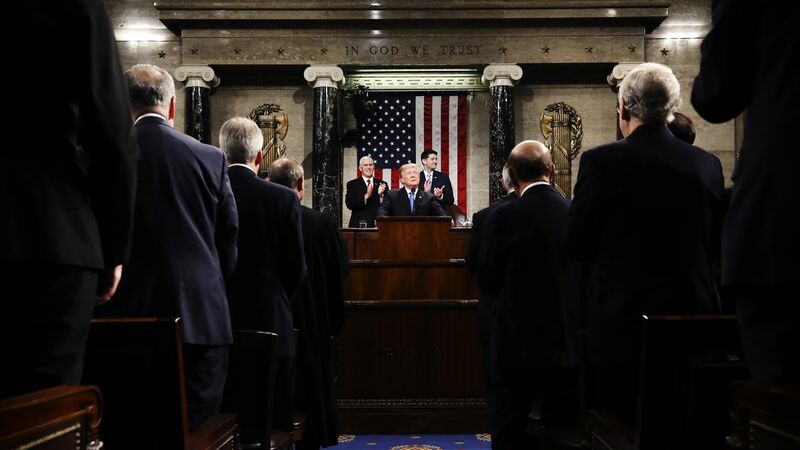 Even if they dislike the particular person who holds the presidency at the moment, their reverence for the church-state and its offices persists. Members of the opposition party used to say about a given president, “I don’t like the man but I respect the office.” I think most people feel that way. So we shouldn’t let the Democrats’ cool reception of Donald Trump the other night distract us. In public, our identities as Jehovah’s Witnesses and Unitarians and Catholics and atheists no longer take precedence. We are all Americans, and devotional exercises meant to instill love of our country are unitive, not divisive. Such exercises, however, are not religion. Patriotism, in this world view, is defined over against public religion…. Religion belongs to the private realm of opinion; patriotism belongs to the public realm of fact. Dissenters from religious orthodoxy must be protected from religion; dissenters from patriotic orthodoxy may be tolerated but not allowed to interfere with the inculcation of the fervent love of country. Thus is the game rigged in the service of power to the prejudice of liberty. I agree that religion has the potential to sow civil strife and violence, but that necessarily includes nationalism too. So if we value liberty and social cooperation we’ll have to figure out how to deprive all religions of government power. One sure way would be to abolish the state.